While I was on the badge page, though, I noted that even though both the Suffrage and Vox Populi badges are rewarding similar behavior at different levels, they're not grouped together the way related badges normally are. Should the two badges be paired together? 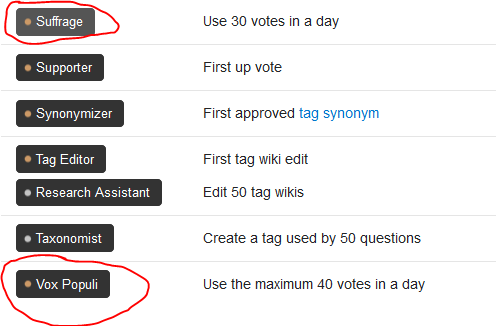 The same shot shows the Tag Editor and Research Assistant badges in their own section, since they are rewarding the same activity (editing tag wikis). Yet for some reason, the two badges that reward voting are separated. The only reason I can come up with is that they're edge cases due to both being the same level - normal badge groupings reward behaviors with progressively harder-to-reach badges, from bronze up to gold, so perhaps the badge 'groupings' are defined as sets of bronze/silver/gold? Is there any reason that these cannot or should not be paired together? Browse other questions tagged discussion feature-request design badges . What's the point of the suffrage and vox populi badges? Why don't the tag badges include questions? progress on Suffrage and Vox Populi down to zero? Is there any systematic relationship between the three classes of badges within one category?